Debt Free, Cashed Up and Laughing - The Cheapskates way to living the good life: Homemade tomato soup, it's easy! When we were first married the only soup Wayne would eat was tomato. Now to me tomato soup wasn't soup, it was something you used to make sauces and casseroles. I like my soup to have lots of vegetables, and lentils, split peas and beans and be based on a hearty stock. I actually prefer it the day after it's made when the split peas or barley or lentils have thickened it up and it resembles a stew. But he liked tomato soup. So every now and then we'd have tomato soup and toasted crumpets or muffins or grilled cheese for a meal. Of course once Disaster Struck, I switched to generic tomato soup. And it was awful, so awful in fact that no one would eat it. Don't get me wrong, it's fine in casseroles and sauces, but as soup it is just awful. I knew it had to be easy to make, soups are. Soup is one of those things we've been conditioned to believe has to come from a can because it's hard to make at home. Ha! I fiddled around with tomatoes and milk and sour cream and tomato paste and finally came up with this soup. It's better than canned soup, much richer and smoother and so much nicer. Best of all when you MOO tomato, or any, soup you know exactly what goes into it. I make this soup for weekend lunches. Sometimes I serve it with grilled cheese sandwiches, other times with toasted, buttered crumpets and vegemite. Occasionally I add a tin of savoury brown lentils to it to bulk it up. This makes a lovely soup that is good enough to serve to guests. Actually the plain soup is good enough to serve to guests. The trick is to puree the tomatoes until they are very smooth. Do this with a food processor or a stick blender. If you don't have either of those tools you can press it through a sieve, this just takes a few minutes and the end result is well worth it. I hope you like my MOO Tomato Soup. Blend the tomatoes until smooth and pour into a large saucepan. Stir in the tomato paste, milk and sugar and mix well. Warm the soup to a simmer over a medium heat, then stir in the butter. Do not let the soup boil or the milk will curdle. Blend with a stick blender or strain to remove any seeds or pieces of tomato. Season with salt and pepper to taste. This makes six hearty serves of the most delicious tomato soup. Thanks for this great recipe... I think I'll make it as a starter before the chicken schnitzel, mash and greens for tonight's dinner! 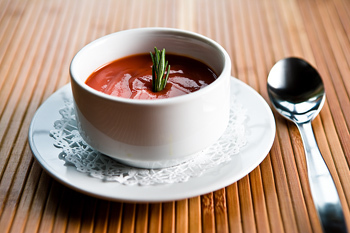 Even though we live thousands of mile apart, your tomato soup recipe is exactly like mine. I stock up on canned diced tomatoes when they go on sale and can have tomato soup in under 5 minutes when I want it - with or without the toasted cheese sandwich. Just goes to show there's no such thing as a new recipe, it's just new to us :) Tomato soup and grilled cheese is a habit in our house, I brought it with me from my childhood. We never had tomato soup without grilled cheese on the side, and I'm pretty sure my kids think that's how it's meant to be served :) With or without, it's always good.